In our homeschool journey, we have had the opportunity to teach our children through do it yourself projects (#DIYplus5) and home remodels. 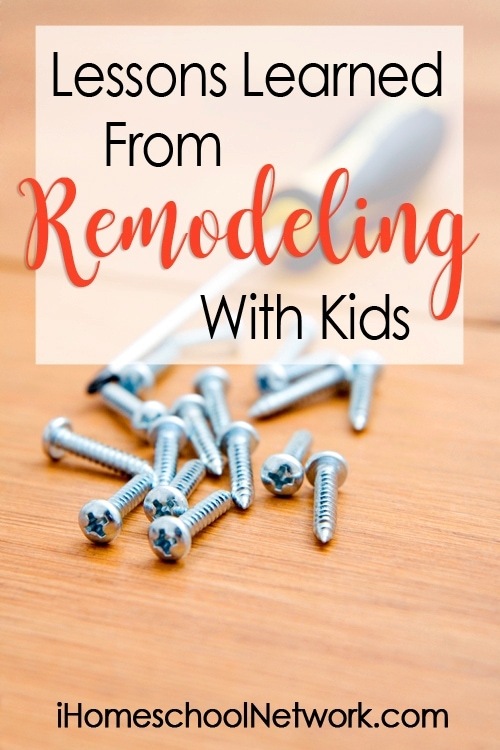 I can almost guarantee none of our children will build houses for a living when they have graduated yet they will have the “know how.” I’d love to share with you all of the lessons we’ve learned from remodeling with kids. When we started our first home remodel, we had no idea how our working on a house would morph into some of our greatest assets and building blocks of our children’s education. They have learned electrical wiring, laying tile, grouting, siding, roofing, scraping popcorn ceiling, installing windows, tape and floating, hanging Sheetrock, and very soon, a whole lot of plumbing. But, better than that they have learned to have a natural curiosity and not to have a fear of something that they have not tried before. Just recently, our eldest son (who is on the pathway of becoming a corporate pilot) took a preview class for Aircraft DC Electricity. He mentioned to me later how many terms he recognized from helping his Dad do electrical work in one of our home remodels. I love that we were able to show him these skills by just remodeling our homes. Even if you do not know the difference between a hammer or a screwdriver, you can still teach your children some basics that can be missed from a regular textbook. The first time my son noticed bad tape and floating at a restaurant, my husband would have dropped his microphone if he had one behind his back because he was so filled with joy. His job as a Dad was complete. His son noticed something about Sheetrock because they had worked on it together in our home. We were on a trip to the Parthenon in Nashville, Tennessee and my daughter noticed the top of the Parthenon columns. I can’t tell you success I felt that she knew the difference between Doric, Ionic, and Corinthian columns. All from studying Ancient Greece and being observant while gazing at buildings and their structures. “Mom, why can’t we go swimming?” Well, we are waiting on the contractor (that we desperately need to finish our project) and we can’t leave until they get here. 4 hours later they show up without the needed samples we had asked for 2 weeks ago. A simple phone call saying “I’m running late, can we meet later?” would have sufficed and would not have caused us stress. My kids learned early, their YES means something and if they can’t fulfill their promise then have the decency to let their customer know what is going on in a timely manner. I could go on and on with work ethic. Look for old furniture. Do the drawers open and close easily and it doesn’t look brand new, it is probably done well. Then find another piece of furniture and see if it works the same. Can you tell the difference in how the drawers are built? Do they have screws or are they dovetail (fit like a puzzle?) Just by observing you can gain so much insight. Find your county courthouse or an older neighborhood with Victorian styled houses. Point out any arches in the roof. Are the windows different from the ones in your house? Look at the doors, are they the same size as your entry door? Do they have door knobs, what color? These little details will start your child to think that not all homes are the same and then they can start noticing on their own little details. If you decide to have any renovations while homeschooling, I hope this encourages you! We had no idea what gifts we had given to our children when we started by just letting them hold a few tools and participate in our ventures. Check out some of our DIYs and how our kids helped! Building a Chicken Coop that the kids designed.